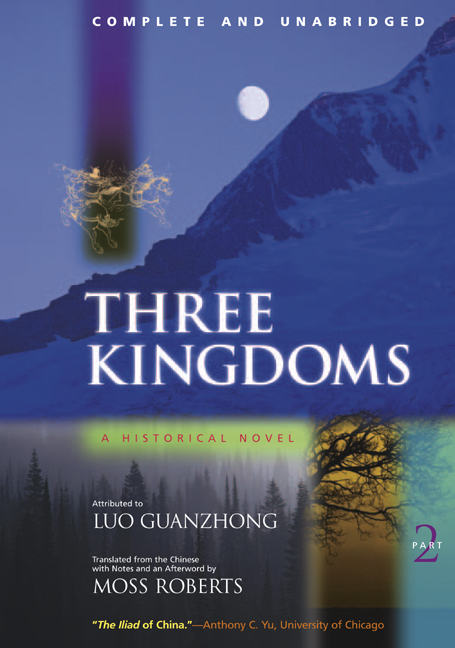 Three Kingdoms tells the story of the fateful last reign of the Han dynasty (206 b.c.-a.d. 220), when the Chinese empire was divided into three warring kingdoms. This decisive period in Chinese history became a subject of intense and continuing interest to historians, poets, and dramatists. Writing some 1,200 years later, the Ming author Luo Guanzhong drew on this rich literary heritage to fashion a sophisticated, compelling narrative that has become the Chinese national epic. Luo's novel offers a startling and unsparing view of how power is wielded, how diplomacy is conducted, and how wars are planned and fought; it has influenced the ways the Chinese think about power, diplomacy, and war even to this day. As important for Chinese culture as the Homeric epics have been for the West, this Ming dynasty masterpiece continues to be widely influential in China, Japan, Korea, and Vietnam, and remains a great work of world literature. The University of California Press is pleased to make the complete and unabridged translation available again. Luo Guanzhong (c. 1330-c. 1400) was a novelist and dramatist who played an important role in the development of Chinese popular fiction. Moss Roberts is Professor of Chinese at New York University. He is the translator and editor of Chinese Fairy Tales and Fantasies (1979). John S. Service grew up in China and was a Foreign Service officer there from 1933 to 1945.